Minerals play diverse roles throughout your body, from the metabolism of energy to supporting your immune system. Along with their other functions, magnesium, calcium, zinc, and potassium impact your muscle contractions, which is related to muscle tightness. If you are suffering from muscle tightness, a multivitamin with additional minerals may help your muscles function better, relieving pain and tightness. 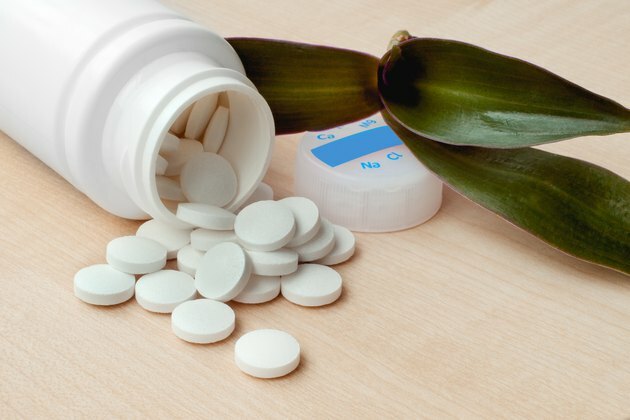 According to the Linus Pauling Institute, your body uses magnesium in over 300 biochemical reactions, including the transportation of ions across cell membranes. Magnesium helps pass electrically charged particles called ions across the barrier that circles your cells. The movement of ions impacts electrical impulses and signals, which control your muscles contractions, which in turn affects muscle tightness. In addition, your body needs magnesium for cell signaling, which also can cause muscle tightness when signals misfire. While calcium is most known for its role in bone growth and strength, it also has a major role in the cell signaling that controls muscle contractions. Muscle cells have channels in their cell membranes that rely on the electrical component of calcium. These channels enable quick changes in the concentration of calcium within the cell, allowing the cell to contract rapidly when the calcium interacts with proteins inside the cell. Improper levels of calcium can contribute to muscle cramping, causing tightness and aches. While zinc does not directly impact your muscle contractions or tightness, it is a mineral that is essential for over 100 different chemical reactions, and it plays key roles in the structure of the cell membrane and cell signaling. In addition, zinc is necessary for your body to repair itself, according to the National Institutes of Health. If you exercise, which breaks down your muscles, you need to get enough zinc in your diet so that your body can repair itself. A zinc deficiency could result in weakened muscles unable to repair themselves, causing muscle tightness and pain. According to the Linus Pauling Institute, potassium is an electrolyte, which means it breaks down into electrically charged particles called ions. Potassium is primarily found inside your body's cells, and it works with sodium outside of your cells to make what is called the membrane potential, an electrical and chemical system that spans your cells' membranes. When the potassium in your cells is insufficient, it can disrupt the membrane potential, which can cause muscle tightness and cramping.